The game contains 7 foam weapons, rules to play in teams (up to 9 players) with Yakuzas as well as a special expansion for people who have balls of steel! The world's three largest Mafia organizations jointly perpetrated the Robbery of the Centuryâ€¦ A few hours later, they are all gathered in a sinister back shop in Hong-Kong, each of them armed to the teeth to split the loot in a good mood. Suddenly, the tension raises, it looks as if the parts were not equalâ€¦ Get ready; the gang war might break out at anytime! Are you keen to face the wildest Mafia of the planet? BANZAI!!! Yakuza introduces new characters, new foam weapons (Tanto, Shuriken and Shotgun), objects and a team based game play for up to 9 players. This expansion not only adds more players, but Japanese weapons. Amusingly, the tanto swings around until it finally hits someone, even if it is the original tanto wielding player. It's also fun to be able to throw shurikens (ninja stars) at your opponent's character. 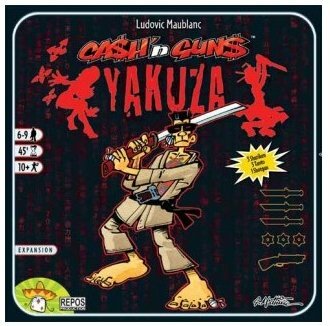 While I wouldn't qualify this as a "must-need" expansion, if you already enjoy playing the original Cash 'n Guns, you will be able to extend the life of the game and add some variety to it with the Yakuza parts. Also, if you for any reason have more people to play games with, go with this expansion to be able to include more in the game. Adds more players to one of the better party games around...what's not to love? Added bonus, you can speak in bad Yakuza accents, and throw foam shurikens at your pals. That's worth the price of admission right there. Yakuza is a very good expansion for a great base game. The base game has a lot of variability built in - especially with the special powers - but if you are looking for even more chaos and the possibility of playing with more players, Yakuza is a great addition. I particularly like the team-element that is added, which really changes the nature of the game and makes it even more fun.